Similarly, Muslim community is demonized by spreading the falsehood that Muslim men “lure” Hindu women into relationships and marriages to convert them into Islam. In fact it was alleged that Hindu women are then recruited into terror organizations and networks. To probe this accusation the state ordered a NIA probe into the case of Hadiya. It is incredulous that the state deployed the NIA to probe the personal relations of citizens. Though the National Investigation Agency (NIA) clarified that it didn’t find any credence in the accusations of Hindu women being forcefully converted or recruited in terror networks, there are still state supported groups which hound innocent citizens who are entitled to their fundamental rights and liberties. 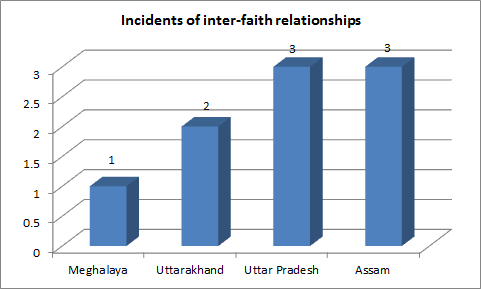 There are 9 incidents of mob lynching related to inter-faith relationships in 2018. In the latest video from Meerut in UP, it could be seen that police officials assaulting a Hindu woman in a police vehicle. The woman was ‘rescued’ by the police was found with a Muslim man. The VHP had assaulted the man and woman for their alleged relationship. “You prefer Muslims when there are so many Hindus around,” taunts a police woman. This indicates the extent of patronage the Hindutva outfits enjoy and also the complicity of the police which is seen endorsing and promoting political propaganda. The other major categories are child abduction and theft. Though these are not strictly related to communal narratives but mob lynching should be viewed in the light of some fake videos circulated which showed a child was abducted by persons in a hijab insinuated that persons from Muslim community are responsible for abductions. The state wise break up of 84 incidents of mob lynching indicate that the majority of incidents of mob lynching took place in Maharashtra (16) followed by Uttar Pradesh (12) and then Assam (10). It is apparent that as far as mob lynching is concerned, it is not limited to North India when compared to communal riots which predominantly take place in North India. Mob lynching is not restricted to the North India but other regions have come into its grip. Communal violence is spreading its tentacles through mob lynching in North East in a big way. While the North zone witnessed 34 incidents of mob lynching, the West zone and North East witnessed 19 and 18 respectively. 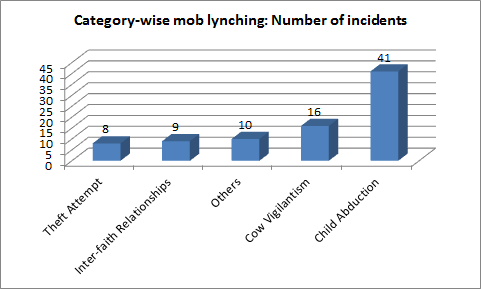 In terms of mob lynching related to cow vigilantism and inter-religious marriages, most of the incidents took place in Uttar Pradesh. 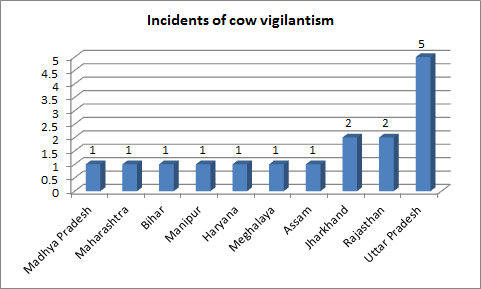 While most of the cow vigilantism related mob lynching was reported in Uttar Pradesh (5) followed by Jharkhand (2) and Rajasthan (2), most of the inter-faith relationships related mob lynching was reported from Uttar Pradesh (3) and Assam (3) followed by Uttarakhand (2). However, mob lynching related to cow vigilantism is still mostly prevalent in the north and central India. 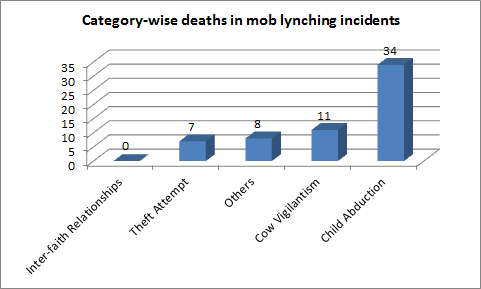 12 out of 16 mob lynching related to cow vigilantism took place in the North India- Uttar Pradesh, Rajasthan, Haryana and Bihar. The incidents of mob lynching targeted the marginalized communities. Mostly the Muslims were targeted in the mob lynching related to cow vigilantism. Muslim men and Hindu women were targeted in the violence related to interfaith marriages. Women were also victimized as the figures indicate — five (5) women died and eleven (11) were injured. For instance, Shantadevi Nath was beaten to death in Vadaj, Gujarat, and three others suffered injuries when a mob attacked them on suspicion of being child-lifters. These women belong to the Nath community which earns its livelihood by begging. Similarly five members of the nomadic Gosavi community in Dhule, Maharashtra were killed by a mob of over 35 over suspicion of child lifting. 10 persons with disability were targeted. For example, a 40-year-old man was beaten to death at Pulicat near Chennai by a mob, on the suspicion of being a child kidnapper. The victim was reportedly a mentally unstable person who used to roam around in the area. He was tied to a pole and beaten to death. Other victims include those who were hearing and speech impaired or suffered from mental illness. This is a very disturbing trend reflecting the brutality and hysteria created which doesn’t spare even the most vulnerable. Involvement of right-wing groups. The involvement of right wing groups is very stark during mob lynching. The stand and aggression of the right wing groups to inter-faith relationships has been strident. They have been openly attacking the youth in public spaces accusing them of “love jihad’. In one such instance, a Muslim youth and his two brothers were beaten up by members of Hindu Yuva Vahini and Vishwa Hindu Parishad at Baghpat court in Agra for carrying out ‘love jihad’, as the youth was set to marry a Hindu woman from Punjab there. It can be seen in a video of the physical assault that the right-wing men beat up the three brothers while dragging them from the court to the police van, even as the police can be seen watching. The woman was a Hindu and the man was from the minority community. Similarly, a couple from different religious communities were harassed and manhandled, allegedly by a group of BJP workers, outside the sub-divisional magistrate (SDM) court in Bijnor, western UP, when they had gone there to submit their marriage certificate on Thursday. One of the two named in the FIR is the district BJP vice-president. These incidents show the extent of confidence and fearlessness enjoyed by such groups owing to the patronage and support they have by those in power. The state of UP in fact gave a kind of legitimacy to such elements by forming the “anti-romeo” squads to intimidate couples suspecting that the Muslim men are “luring” Hindu women. The culture of mob lynching enjoying sometime overt support of the state and other times tacit support heralds a complete collapse of rule of law and encourages majoritarian oppression. Mob lynching is a new form of communal violence where through the assault on individuals is carried out in the most macabre manner to strike fear in the vulnerable communities and establish the hegemony of the majority or the powerful. The result is uncontrolled spiralling culture of violence and impunity which poses a formidable challenge to constitutional law and democracy.